GeoNetwork is a catalog application to manage spatially referenced resources. It provides powerful metadata editing and search functions as well as an embedded interactive web map viewer. It is currently used in numerous Spatial Data Infrastructure initiatives across the world. GeoNetwork has been developed to connect spatial information communities and their data using a modern architecture, which is at the same time powerful and low cost, based on the principles of Free and Open Source Software (FOSS) and International and Open Standards for services and protocols (a.o. from ISO/TC211 and OGC). The software provides an easy to use web interface to search geospatial data across multiple catalogs, combine distributed map services in the embedded map viewer, publish geospatial data using the online metadata editing tools and optionally the embedded GeoServer map server. Administrators have the option to manage user and group accounts, configure the server through web based and desktop utilities and schedule metadata harvesting from other catalogs. 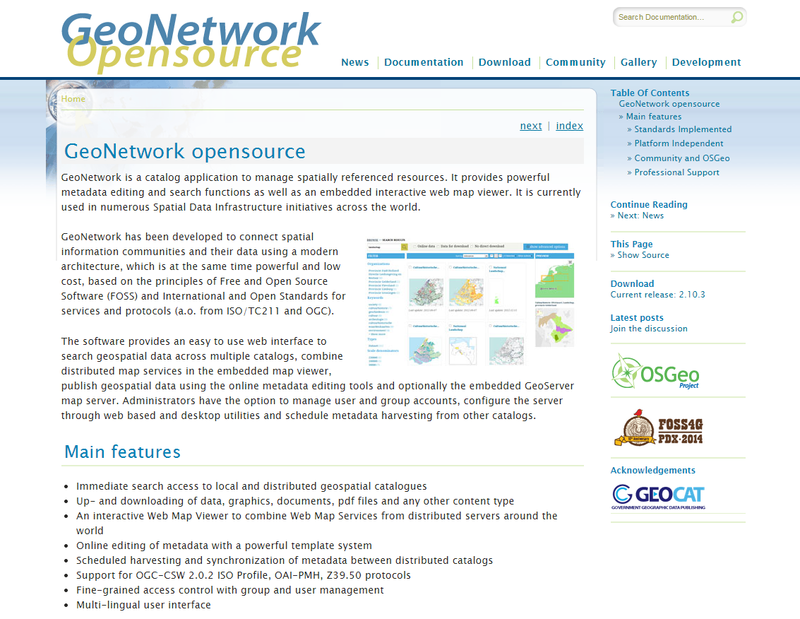 GeoNetwork is part of the Open Source Geospatial Foundation (OSGeo) software stack, providing software you can trust to be free, open and sustainable.